Geithners explanation of the administration's small-business tax plan came in an exchange with first-term Rep. Renee Ellmers (R.-N.C.). Ellmers, a nurse, decided to run for the U.S. House of Representatives in 2010 after she became active in the grass-roots opposition to President Barack Obamas proposed health-care reform plan in 2009. She then challenged Geithner on the administrations tax plan. Looking into the future, you are supporting the idea of taxation, increasing taxes on those who make $250,000 or more. Those are our business owners, said Ellmers. Government must shrink, so individual liberties can be restored. >Government must shrink, so individual liberties can be restored. We are living in Bizarro World. "Geithner: Taxes on Small Business Must Rise So Government Doesnt Shrink "
Hey Timmy, that's the objective. Fire all you assholes and set Americans and American enterprise free. PS: It's interesting that you want to increase taxes, but you yourself should be in jail yourself for tax fraud. Democrats all need to never be let into power again and the pubs better clean up their crap as well. We are in a depression and MO goes to Africa and wastes OUR money ro promote some race thing and do this? Looks like you failed ECON 101 when you went to college. And to have that happen with smaller taxes, would be a double win. Geithner exhibiting the ratchet approach to leftism - where the ratchet only goes in one direction: bigger govt. Its corallary is the mudslim approach to "their" lands: Once mudslim, ALWAYS mudslim. stop funding those working against your best interests. Let’s take that a step further and ask all Americans to contribute their fair share. Not working? 10% of median income tax obligation under my new plan. 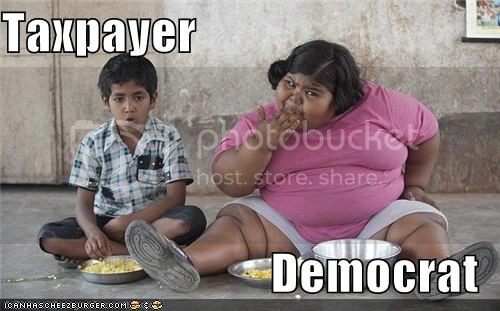 LOL - Under my new plan, taxes for freeloading deadbeat democrat voters will necessarily skyrocket to 10%! You got that right...but we’re peons. They know much better and we should never expect their empire to get cut or eliminated. They have no problems at all burdening everyone else but themselves.